A federal court on Monday ordered that the bump-stock ban set to go into effect on Tuesday cannot be enforced against members of the gun-rights groups currently suing to overturn the ban. The D.C. Circuit Court issued an order staying enforcement of the bump-stock ban on Saturday but only for the plaintiffs in the case. The plaintiffs then filed an emergency request to expand that stay to include the general public. The court denied that request but did issue a clarification on Monday stating that all members of the gun-rights groups involved in the suit are covered by the stay. "The D.C. 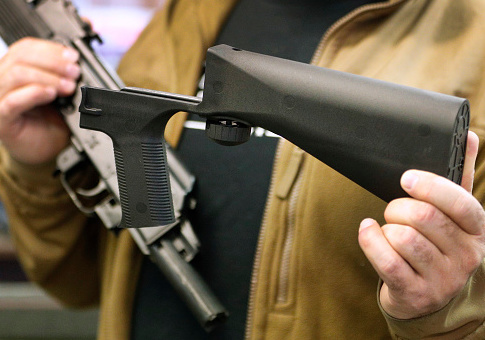 Circuit's order today in our ongoing bump stock litigation makes it clear that the Circuit Court's current administrative stay of the ATF bump stock ban Final Rule applies to current bona fide members of Firearms Policy Foundation," Brandon Combs, president of the foundation (a plaintiff in the case) told the Washington Free Beacon. "We have already filed an emergency stay application with Supreme Court Chief Justice Roberts." Members of the other gun-rights groups involved in the case, the Madison Society Foundation, Inc., and Florida Carry, Inc., are also covered by the order. So are individual plaintiffs Damien Guedes and Republican Missouri state representative Shane Roden. The gun-rights groups filed their case after the Trump administration announced in December 2018 it would unilaterally ban bump stocks in response to the October 2017 Las Vegas shooting where the attacker employed the devices on some of the rifles he used. The Department of Justice said it would effectively reinterpret the statutory definition of "machinegun" in order to incorporate bump stocks. The groups said the reinterpretation was an unconstitutional rewriting of federal law. The case against the ban saw a setback last month when a lower court sided with the government and denied the plaintiffs' request for a preliminary injunction against the ban. The stay is not an indication that the court will ultimately side with the gun-rights groups when the case goes to trial. "The purpose of this stay is exclusively to give the Court sufficient opportunity to consider the disposition of this highly expedited appeal, and should not be construed in any way as a ruling on the merits of the appeal," the court wrote in its initial order. The plaintiffs have already filed an emergency request with Supreme Court chief justice John Roberts to issue a broader stay in addition to the limited one granted by the circuit court. This entry was posted in Issues and tagged Gun Control, Guns, Supreme Court. Bookmark the permalink.